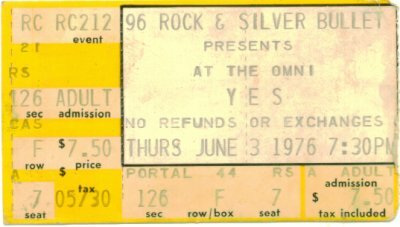 My first Yes show. I was 15 years old and stayed with my older brother who lived in Atlanta and took me to the show. The band made an appearance at Peaches Records and did their handprints in cement outside the store. Patrick Moraz had a video camera and was video-taping the fans taking pictures of the band. They were nice and hung out, signing autographs and mingling. Instead of the traditional "Firebird" opening loud rumbling sounds played as the curtain rose and the Roger Dean shapes above the stage moved into position. The band were playing along at that point (we called it stampeding elephants) and my brother jokingly thought a cloud of amyl nitrate was released. I was thrilled to death. My favorite thing they played that night was "Gates of Delirium". Good times. Man, it is hard to believe it was that long ago. Went with some friends just after returning from Germany. Again the keyboards as a staircase, just unbelievable. One of the best shows. 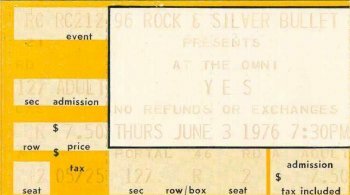 My friends didn't even know who Yes were, they thought I was a little nuts for the band but they hadn't seen me in about 4 years so they went. I remember sitting in a Hardee's on the way back to Anniston. Everybody was just stunned. I remember one of the girls saying, "Those guys are so good, I bet you can't hold a conversation with them!" God, you boys were (are) good!!! I got a chance to meet Jon Anderson later that evening after the concert in the Omni Hotel. A friend of mine and I were staying on the 10th floor, and the band had reserved all of the rooms on the 14th floor. We actually bumped into Jon earlier that afternoon, when the elevator we were on stopped and the door opened and Jon and another guy were standing there! Jon smiled at us, but his friend (a big guy, maybe a roadie or bodyguard) grabbed Jon's arm before he stepped into the elevator and said, "We'll take the next one", and the door shut. My friend Dave and I looked at each other and started laughing like crazy! Dave announced right then and there that he was going to try to get Jon to visit us later that night after the concert was over. I just smiled as said, "yeah, right, Dave." After the concert, we staggered back to our rooms, still dizzy from the wonderful performance by the band. Dave walked over to the phone and said, "Now for the invitation to Mister Anderson", and called the front desk and asked for Jon's room number, and to my surprise, they gave it to him. He grinned and then promptly called Jon's room and asked him if he wanted to drop by our room for "a drink and a smoke". Dave had even bought an expensive bottle of Pinch Scotch whiskey earlier that afternoon before the concert to sip on after the concert, and planned to offer Jon a drink. Dave hung up the phone and grinned and said, He said he'll be here in about 15 minutes." I replied, "Come on, Dave, he was just saying that to be polite. He won't show up here. He has no idea who the hell we are!" Dave replied, "You just wait and see." I was a little buzzed from a couple of beers and a little pot, and laid down on the bed and closed my eyes and said, "OK, we'll see." Well, to my complete and utter surprise, there was a knock on our door after about 15 minutes. Dave opened the door, and who should be standing there but Mr. Anderson himself! Dave quickly introduced himself and shook Jon's hand and began gushing about how much he enjoyed the concert. I was momentarily stunned. He was actually in our room!! I jumped up from the bed and said, "Damn!" I recovered from my shock quickly and shook his hand and introduced myself. Jon was dressed in white pants and a white peasant shirt, hair still wet from a shower, and he was carrying a three foot long bamboo flute. Jon smiled and said to me, "So, you enjoyed the show?" I nodded and grinned and said, "Man, it was the best concert I've ever seen!" Jon grinned and thanked me for the compliment. Dave gestured for Jon to have a seat, and hurried over to the dresser, where the bottle of scotch sat, and opened it. He then turned and asked Jon if he cared for a drink, and Jon answered, "Do ya have any Bourbon?" Dave replied, "No, but I have some fine Pinch Scotch here!" Jon then shook his head and said, "No, but thank you." I could see Dave's disappointment in his eyes (because earlier that day in the liquor store, he almost bought a bottle of bourbon instead). I began to ask Jon questions about his songwriting, where he got his inspiration, and what his listening tastes included. He talked for several minutes about these subjects, and even asked me what my musical interests were. I worked up the nerve to ask him if he would be willing to play us something on his flute. He said he would be delighted to, and began playing a slow, melodic tune that seemed to last for hours, although it probably wasn't more than about one minute long. I closed me eyes and just seemed to drift away while he played. Another surprise happened at the Omni, in Atlanta, where the band encored the Jimmy Carter constituency with a rousing version of the Beatles' rock classic, "I'm Down." Even the bands are being struck by the new wave of Beatlemania. [Squire] "That was pretty crazy. We may even do it again at some point, but it was spontaneous. We always try to surprise people. It was an idea we had back in England. I don't know why, it's just one of those things. We just did it one day in rehearsals as a laugh, you know, and we enjoyed it so much that we said 'Hey, we may even play that on the tour as an encore number.' But we really didn't think we would, seriously, then just one night we did it. It's a good song, that."